We continue with the second part of this essay by Mr Zachary Thomas; to read the first part, click here. The full experience of liturgy as participation in and becoming simultaneous with the whole divine Act of redemption is indispensable to an integrated Christian life. Only fortified by this complete expression and completion of the whole Christian Mystery can we go into the vale of tears to work Eucharistically through our Golgotha. Indeed, liturgy is a mountainous, unshakeable, insistent foundation for all the cardinal and theological virtues, but especially of hope. In The Weight of Glory, C.S. Lewis lamented that modern Christians often lose the hope of salvation because, mired in the ugliness of modern life, and fed a dry moralizing or dogmatizing sort of religious piety, they can conceive no vision of the grandeur and glory of the Christian vocation. It is precisely the liturgy that the Church has always offered as the sturdy support of these virtues, a gargantuan “substance of things hoped for.” After attending evening services at a Catholic chapel in Philadelphia (rosary, Vespers and Benediction) the strict Puritan John Adams wrote, “I wonder how Luther ever broke the spell?” The liturgy is indeed the Church’s spell, which charms the soul irresistibly toward that end to which she calls it. Faced by the claims of the Church’s cultic life, the only two honest responses are a wholesale cynical rejection or wholesale embrace of its full implications. The Christian liturgy is the most profound exegesis of man as imago Dei, far surpassing the combined letters and arts of all civilizations of all history. It carves this image into the flesh, impregnates the imagination, breathes itself into the soul’s affections, overtakes the mind’s perceptions, directs the will’s resolutions. Cardinal Ratzinger speaks thus of God’s crafting work in us. The third question of the Baltimore catechism (Why did God make us?) can rightly be answered in a declarative sentence. But the immeasurably stronger affirmation is found in the splendor of the liturgy. “God made us to show forth his goodness and to share with us his everlasting happiness in heaven.” Each of these terms only achieves its full meaning in liturgical action: in orthodoxy (right worship) the lovable face of God shines forth. Here most particularly we see his goodness, his loving kindness, and get a taste of the everlasting happiness he holds out to us. Liturgy is truly heaven on earth. What does orthodoxy require, then? What can make the splendor of the divine image shine forth in man for all the world to see? Only the advent of God taking up—“overshadowing”—our actions, as Christ took up his carpenter’s hammer. As a strict matter of validity, this is possible through any of his ordained ministers using the minimum of matter and form. But this is only half the theological truth. A sacrament looks like what it does. Grace descends fully only with nature’s assent. The covenant requires faithfulness also from God’s people. Therefore, in her public worship, the Church must offer herself as a fitting and unblemished sacrifice, as the womb of Mary, as a fitting vessel in which the Holy Sacrament can come forth. It is necessary that, in the public rite of the Catholic Church, the juridically instituted public expression of the Church’s whole life, history, and being, there be exemplary standards of liturgical splendor that properly show forth the imago Dei and display the cosmic history of redemption with glory and clarity. For the full public worship performed by the Mystical Body of Christ, head and members, is nothing else than the celebration of the marriage between God and the whole sanctified cosmos, including the Church triumphant and suffering. It must look like what it does. If we take this dogmatic and historical fact seriously, it has several implications. First of all, it means the acceptance of all reality, which has all been redeemed. The full reality of the Eucharist demands that we consent fully to the mediation of body and matter, not try to escape from it. Thus, liturgical splendor requires excellence of craft, in every sense. God the sculptor uses the hands of human artists: singers, painters, brick-layers, and their donors. It requires excellent and well-paid musicians. Most of all, it requires abundant monastic houses and cathedral canons to set the gold standard in a diocese. This is all as much to say that God asks for the full benefits of human culture to help elaborate the fullness of the Mystery he continues to reveal in His Church. This implies complete dependence upon one’s artistic inheritance. It is hubris to think that one age alone can surpass the careful accumulation of centuries. In the Sainte Chapelle, St. Louis has taken care that the sacred iconography takes up the whole life of his realm. The art depicts his own kingdom, the angels and saints, Scriptural figures, and wraps them all into the history of salvation, with its center on the altar of Christ. All of this, with no expense spared in materials and craft. We cannot adopt art forms that deny the nobility of man’s nature, or the glory of his gratuitous redemption. This is not to say that modern forms are per se forbidden, as an abundance of contemporary artists working in modern idioms can testify. But it does forbid art that does not exalt the liturgical mystery in its full splendor. Art that obscures or distorts the beauty of natural form is a form of Gnosticism that denies the salvation of the flesh. Intentionally minimalist church art has the effect of denying the beauty and joy of salvation. All of this aesthetic endeavor and ceremony must be deeply tied to silence and prayer as its source. Contemplation is the workshop in which God molds each soul, and from which he brings out these gifts to adorn his Church. Too often, Catholic liturgies have gotten rid of everything that could remind man he is a cosmic priest, made in the image of God. Not a glimmer of the glory of God’s adopted sons shines through the morass of our dreary “worship spaces.” This is largely because the last century’s reformers simply got theological anthropology dead wrong, misunderstanding entirely the nature of cult as man’s cooperation in the doing of divine things. Men do not want a didactic session scribbled by expert seers of the spirit of the world, or the spontaneous eruptions of emotion that surprise, but do not last. They do not want a Scripture lesson or political agitation. They do not want an industrial liturgy. They certainly doesn’t want their pastors’ ingenuity. They want to see, and participate in, the spectacle of God made man in the world, the mystical feast of the Groom with the Church of all ages. They want to be borne down by the weight of glory that is the Trinitarian economy represented in the sanctuary. Instead, we are often given a depressing image of ourselves, which may indeed have the benefit of being always simple and easily accessible, but has the downside of being rather boring. We are “present to ourselves as a worshipping community,” but we do not confront the host of Saints before the Throne. Transfixed in this narcissistic gaze, we waste away before a pool of self-loving and self-loathing, unable to escape from a lethal self-intuition. It is no wonder so many have left in despair. Until we unwrap our liturgical theology from the quasi-Hegelian and quasi-Marxist bands in which it is slowly suffocating, the true glory and attractiveness and loveliness of the Gospel, the light of Christ’s countenance shining nobly through her saints, will remain obscured, and we cannot hope for a resurrection of Christian life and vocations. This means rejecting wholesale, if not every practical reform of the last five decades, certainly the flawed anthropology that largely motivated them. It means learning again from our liturgical tradition—and that of the East. We have to learn again what it means to celebrate liturgy, as sons redeemed, dancing like David in the light of God’s face, as a divine economy of salvation in which every man and every community surpasses itself, exceeds the bounds of its own temporality and enters into the great Mystery which is Christ in his Church, for all ages, unto the ages of ages. 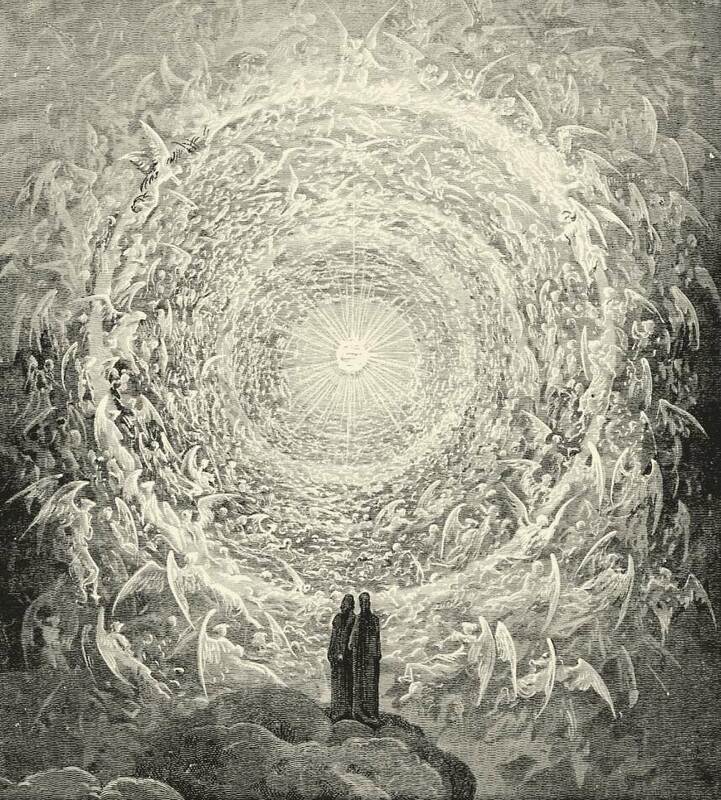 Gustave Doré, Illustration for Canto XXXI of the Divine Comedy, Dante and Beatrice See the Highest Heaven. 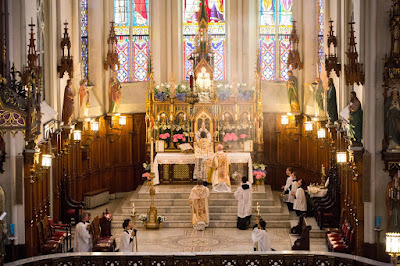 I have argued that the liturgy is the place par excellence where the image of man-in-God and God-in-man are projected, displayed, and performed by the Church. As such, they are the chief support of the theological virtues by which alone man can reach heaven, and the model for all Eucharistic work. It follows that the manner in which we celebrate the sacred liturgy—with consummate decorum, the highest artistic standards, and a true super-abundant splendor and solemnity—is essential to her mission in the world. She is simply not performing the Christian Mystery if her liturgy amounts to an implicit denial of cult, a half-hearted iconoclasm or outright idolatry; because to deny cult is to deny the imago Dei at its very root, to deny man his vocation as cosmic priest. 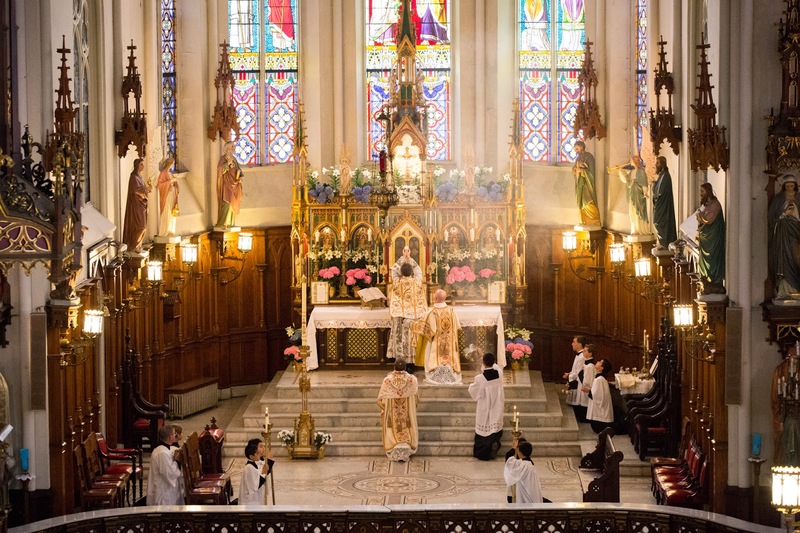 Liturgical splendor must be at the root of the New Evangelization, because Evangelization is divinization, and only from the liturgy can the believer learn what it is to act divinely.